Neuschwanstein Castle was built by King Ludwig II of Bavaria. In his later years he sublimated his confusion about his sexuality and frustration at coming out the poorer end of an agreement with Bismarck into building beautiful castles in which he lived as a recluse. Eventually the crippling cost of the constructions lead to his family and government conspiring to have him declared mad and forced from the throne. It’s this background which makes the current day Neuschwanstein such a study in irony. The castle built to house one man in seclusion now gets thousands of visitors a day. And the expensive waste of money is one of the Bavarian Government’s main sources of revenue through very effectively extracting cash from all those visitors. We did our bit for irony today, and honestly if anyone can be called mad it was us. We foolishly believed that going to Neuschwanstein on a freezing day between Christmas and New Year would mean fewer crowds. We realized our mistake the minute we got on the train. Cold Winter day or no, there were absolute floods of people taking up every available spot. Two hours of cheek by jowl, or for the boys cheek by cheek, was exhausting. We eventually arrived to find ourselves in a queue to buy tickets that took an hour to wend it’s way to the cashier. Upon arriving we bought ticket for the first available tour (you can only visit in a tour) which was three hours hence. Everywhere you looked there were people coming or going, absolutely everywhere. It was like being in Disneyland, but with snow and extra people We whiled away some of the time with lunch and sallied up to the Castle. This revealed the other flaw in our plan. 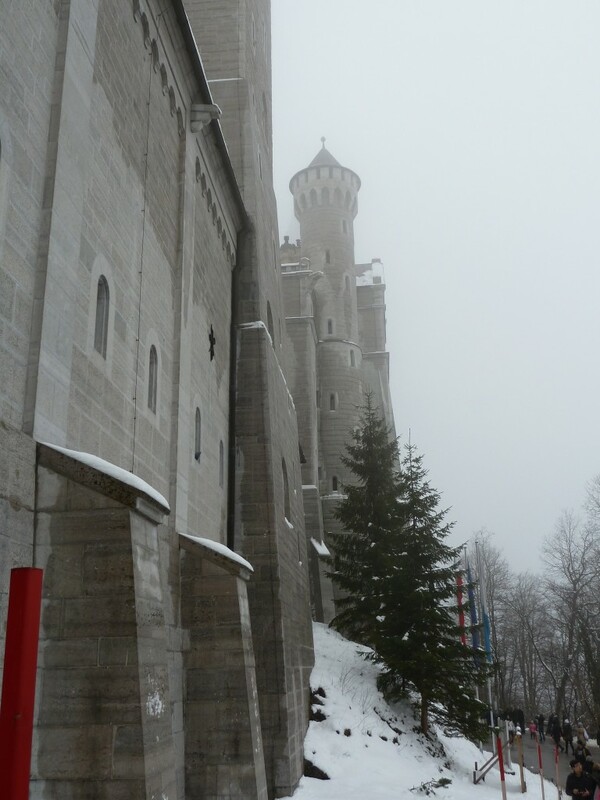 All of the footpaths through the woods were closed because of the snow, and the low-lying clouds meant Neuschwanstein’s fairy-tale features were reduced to indistinct gray shadows. Cold and a fed up with people, we decided to skip the tour rather than wait another hour Instead we indulged in another tourist rip-off and got a horse-drawn carriage down the mountain, much to the boys’ delight. The train back was as bad as going. We have just all spent over an hour standing in an incredibly crowded corridor. The only saving grace was that being jammed beside the door meant we were amongst the first off the train and so the first on to our Munich train – and so I am writing this from the blessed seated position. So, traveller tips here. First only go to Neuschwanstein with your eyes open. Be prepared for an extraordinarily crowded tourist experience. The train (buy the great value Bavaria day-trip card, by the way) is likely to be tough with kids. Finally, be aware that the beautiful bit is the outside of the Castle, so only go if the weather is clear and you can actually see it. And poor Ludwig? Well, Ludwig died in mysterious circumstances a day after being detained in Neuschwanstein. Some say he was shot by the Government. Some say he drowned by accident while trying to flee to Austria. And some say he committed suicide, faced with the trauma of being forced out of his seclusion. Me? I’m sympathizing with that last view right now. This experience reminds me of an experience I had visiting Monet’s garden outside Paris. Ah Europe. Your quick thinking and changing plan for the horse and carriage was a good one. 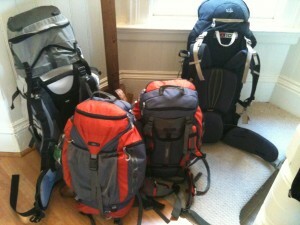 Travel tip – be flexible – bail out when necessary. Still jealous/envious. I ask you, would Ludwig have had a better time of it in Sydney 2010 or just .. . . well not much space here for castles, I wonder what creative energies his money could have lent itself to in these times. New Years Eve tonight and you know what that means!. Cheers to your travelers, we miss you and, strangely too, we miss (‘we’ means me and Pete)Europe. Enjoy!